At the age of fourteen I was given an art class assignment: design a typeface. I failed miserably (2/10). That began a lifetime struggle with understanding what typefaces were, how they worked, and how readers responded to them. Like everyone else with similar interests in those days, I bought the Letraset book and pored over the weird and wonderful typefaces like Odin and Galadriel. Like almost everyone else who has retained their typographic passion, over the years my interest in the wonderfully weird has faded. It is the hard-wearing, hard-working ‘bread and butter’ typefaces which we see thousands of times a day as body text which set their design stamp on our visual world. However, over the last five years, I’ve run into a problem. It seems that there is no accepted theory of how to choose a typeface. 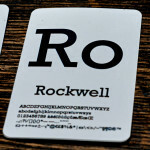 There are some very useful classification systems, but just because a typeface is a uniform slab-serif geometric (such as Rockwell), this doesn’t mean that it will make readers respond in the same way as other uniform slab-serif geometrics, or differently from a transitional humanist serif, a didone or a Swiss sans serif. In other words, being able to categorise a font is useful for librarians, but not for designers. Let me say at this point that you do not need to be a designer to be reading this. Every one of us faces font choices every day—something which could not be imagined even thirty years ago. The most universally derided font in the world is Comic Sans. However, every time that you see a document printed out or emailed in Comic Sans, it means that someone has made a deliberate (but entirely misguided) choice to use it rather than whatever their computer helpfully offered them. 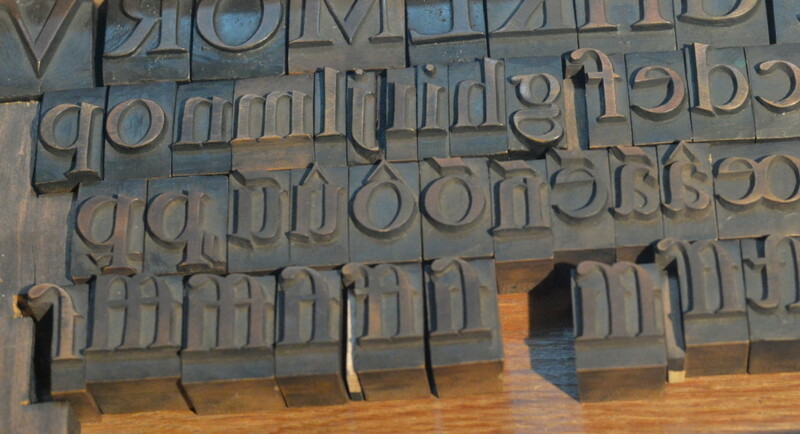 A few studies have been done into reader responses to a handful of typefaces. A newspaper article set in Baskerville, for example, comes across as more credible than one set in Georgia, Helvetica or Trebuchet. On the other hand, Arial and Times Roman appear to have no appreciable difference from each other in how readers respond, despite the fact that they look totally different. In this article, I want to offer a method and a system, and I want to discuss 21 ‘archetypefaces’. 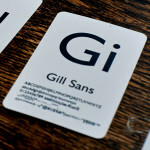 These are archetypal in the sense that if you read about fonts at all, you will see these names coming up again and again, and they each represent a distinct kind of face and feel. Many familiar typefaces are not in the list: no Caslon, no Goudy, no Avant Garde Gothic, no Palatino, and so on. But those missing typefaces are each similar to one (but no more than one) of the archetypes I’m discussing. I also want to suggest three essential tools for choosing fonts. I will look at these first. You need a laser printer because print is still king. In fact, print is becoming more the king as the world digitalises. Things which are printed in black and white are becoming more powerful and more credible, whereas internet and email text is becoming more transitory and less credible. It is trivially easy to email ten thousand people, or to post something on Facebook, or edit an entry in Wikipedia. Something which is published in a printed newspaper, sent as a letter through the post, or in a book in a bookshop carries vastly more authority. 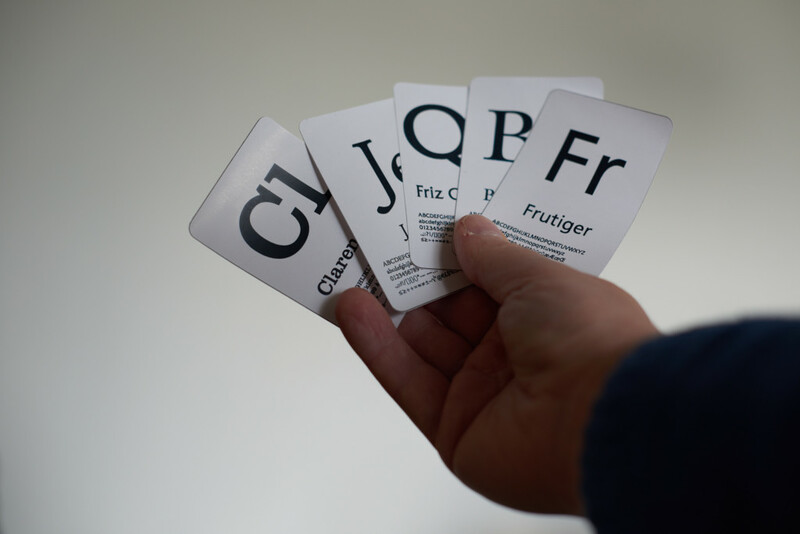 To understand and choose typefaces, you have, at some point, to print them out and see how they appear on the page. TypeDNA is a piece of software which scans all the fonts on your computer and tells you what is similar to what, and what goes with what. 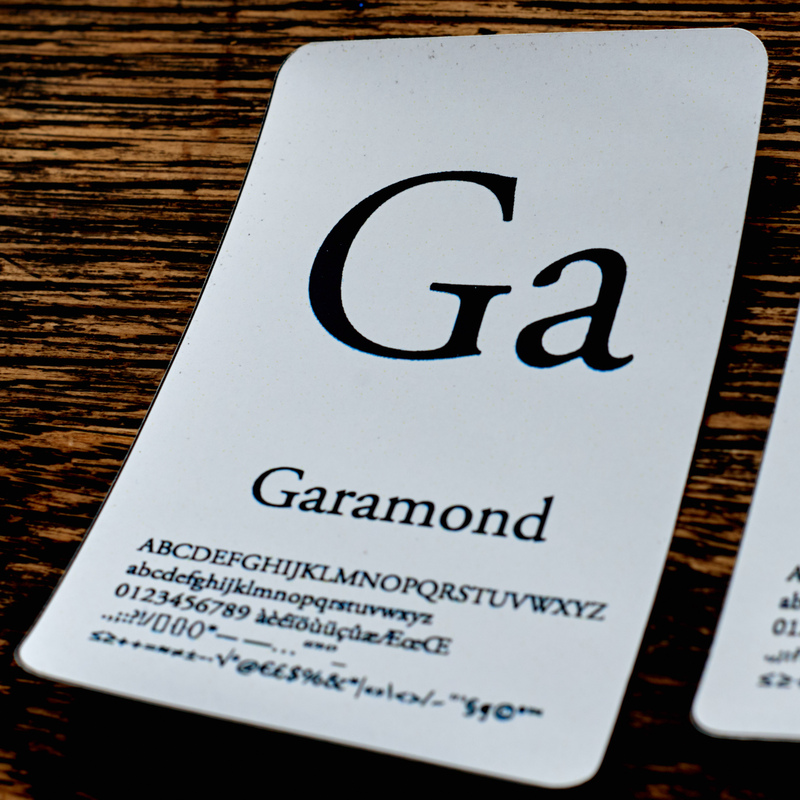 It works pretty well, as long as you are sensible and avoid its offers of ornate or display fonts for day-to-day work. It works on Mac or PC, and there’s a trial version. Google it. FontBook lets you look quickly at pretty much every font there is, by category, period, use case, and so on. If you don’t have an iPad, you can do this on the web, but FontBook is quicker and generally more useful. Often, if you can understand what kind of font you are looking for, FontBook will help you find something that looks like that. My archetypefaces are Garamond, Jenson, Walbaum, Bodoni, Baskerville, Clarendon, Friz Quadrata, Rockwell, Bembo, Cambria and Caecilia (serifs), with Franklin Gothic, Futura, Gill Sans, Helvetica, Univers, DIN Mittelschrift, Eurostile, Frutiger, Optima and Avenir (sans-serifs). So, my notion is that how we respond to typefaces is based on three factors: Intrinsic, Implicit, and Associative. 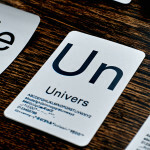 Intrinsic factors are design universals. They are based on the shapes of the letters. We can argue about whether the Golden Section really is an intrinsic rule, or merely a Renaissance aesthetic read-back to the classical period, but we can certainly agree that factors such as negative space, leading lines, and all the other principles of composition play a role. Implicit factors are the methods of production implied by the letter forms. A script font implies that it was written with a pen. Of course, everyone knows that it wasn’t, especially if it appears in sixty foot neon letters. Nonetheless, it carries implications. A narrow font with strong serifs may imply that it was carved in stone. Trajan, a font which appears ubiquitously on movie posters, was drawn from Trajan’s column. The implicit production value suggests permanence, authority and cost. Associative factors are where we’ve seen that font before, or something like it. Why is Comic Sans so universally derided? For what it is, it isn’t bad: as the name implies, it’s derived from comic book writing. 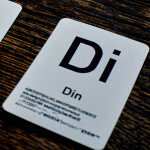 Intrinsically the letter forms are uninteresting, but the shapes imply that it is swiftly written with a marker pen, made to be consumed in small chunks of text next to an illustration. There are many marker fonts and comic fonts out there which are not intrinsically better, and which imply the same production. The problem is association. We have seen Comic Sans used inappropriately for everything. Office bosses use it to soften a message which can’t or shouldn’t be softened: “To all staff, John Wiggins will be leaving us today, following a disciplinary hearing.” People have received hospital letters in Comic Sans telling them they need a serious operation (one reason why the NHS is now so serious about using Frutiger, or, when not available, Arial). We’ve seen it used to advertise products which have no comic heritage, to invite us to black-tie parties, and as a ‘friendly’ font in hundreds of emails from people we’ve never met. Association with excessively bad font choices has ruined Comic Sans. Fonts which call attention to themselves (always a bad choice for body text) attract associations much more quickly, which is one reason why Times New Roman and Arial are tolerable, whereas Comic Sans (or, for the only slightly more discerning, Papyrus) is derided. Actually, Times New Roman, which once had the associations of the most respected newspaper in the world, is generally regarded as low credibility. Why? Because, like Comic Sans, we’ve seen thousands of letters and other documents which should never have been set in a newspaper font, and whose content we disbelieved, or regarded as not entirely honest. If you want to weight these factors, I would say that it’s 1 x intrinsic, plus 2 x implicit, plus 10 x association. Associations, of course, are different for different people, and they can change quickly with time. They are also a good reason to go slightly off the beaten path. 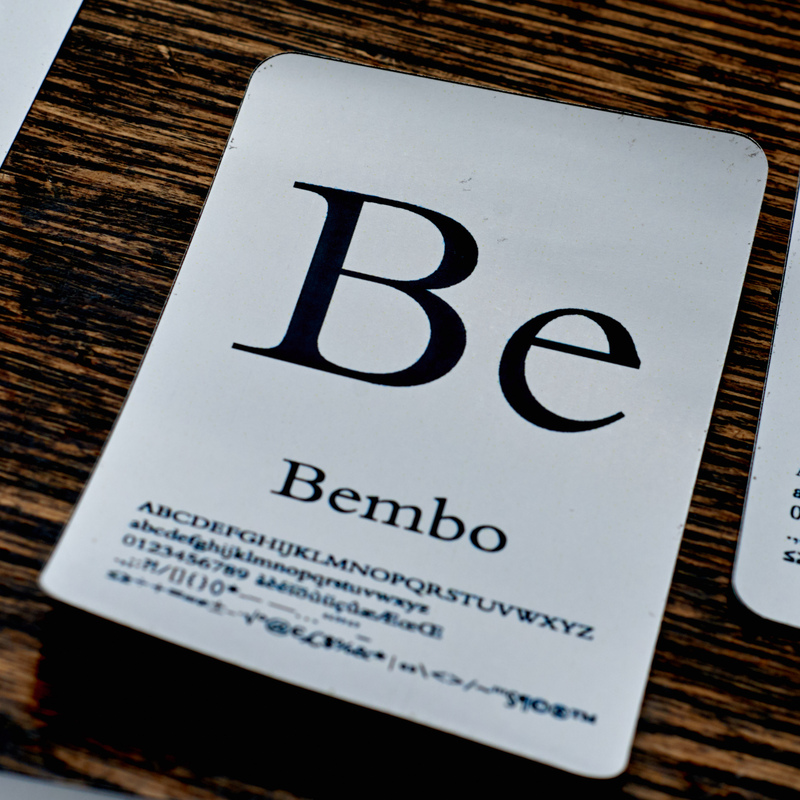 If you’ve decided that Bembo is exactly the font you need, you might consider ITC Leawood. It does all the things Bembo does and more, but it isn’t Bembo, and so the chances that it will be suddenly associated with something you don’t want after someone else’s major marketing campaign are less. The original type designers, from Gutenberg onwards, were not particularly concerned with intrinsic properties of design. As much as possible, they were trying to reproduce the look and feel of handwritten manuscripts. However, they were extremely responsive to the reading public—if noone bought they books, they went out of business—so the black letter manuscript forms gradually evolved towards greater legibility. This, too, was not just a public service. A more legible font can be set smaller and still read easily, which means less pages to set and less paper costs. Moveable type was an enormous innovation and made the widespread distribution of books (and hence literacy) dramatically cheaper and easier. Still, if you’ve ever actually tried to set metal type, you’ll know that each page takes a lot of skill and time. 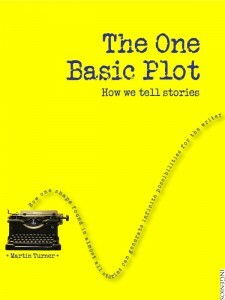 The page, once set, could not be stored, so a reprint required doing the whole thing over again. Up to the end of the 19th century, type evolved according to universal design principles (better balance of positive and negative space, widening of the ‘m’ and ‘w’ to make them more legible, greater distinction of forms, and so on). At the beginning of the 20th century designers, especially from the Bauhaus, constructed entirely new forms based on their modernist design aesthetic. Until then, letters tended to be Classical, in the sense that they used the proportions of Greek and Roman stone cut letters, Uncial, in that they used the forms of mediaeval manuscripts, or Humanist, in the sense that they used proportions reflecting Leonardo’s drawings of the human proportions, and also the mathematical Golden Section. The 20th century brought us Geometrics, which used forms drawn with a ruler and compass. These intrinsically have a different set of properties from classical, uncial or humanist letter types. Intrinsics are not very useful when distinguishing between different kinds of good letter types, because in all of them, the intrinsics are essentially right, otherwise they would never have survived to the present day as body text. Where the intrinsics are poor, letters have often been used for display typefaces. Stencil, Broadway, Mistral, and every other weird and wonderful typeface has intrinsic qualities which make it hard to read—except when set large. There is a place for this, which we’ll look at in the third section. Implicitly, things which look like they are written with a pen appear more personal. Things which look like they are carved in stone are more imposing. Things which look like they have come out of an early computer printer look more futuristic. Those are essentially the three technologies or methods of production which most people have some awareness of. Real connoisseurs of print production methods may be able to separate in their minds flexo, thermal, moveable type, hot metal type and digital, but, for the most part, it’s pen, stone or computer, with ‘printed’ being the neutral mean. What does this mean, practically? All fonts either have uniform strokes or some deviation from uniform, and all fonts either have some kind of serif, or they don’t. Although it’s possible to have a non-uniform font which is not more pen-like, in practice you never see this in body text fonts. Most serif fonts have some pen-like variation in stroke. 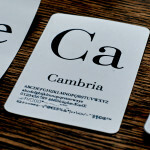 Cambria, a recent serif font, has quite strong variation, as would be made by a very flexible pen, such as a quill pen. Jenson, a much older font, still has variation, but is more uniform. Slight variation in weight gives a font a sense of humanness and personality. Strong variation gives a distinctively old fashioned feel, mainly because handwriting now is almost uniform, even when done with a fountain pen. Serifs—the little terminations at the end of strokes—appear in almost all Western stone carving, although runes, also designed to be carved in stone, were unserifed. As a rule, handwriting is unserifed. 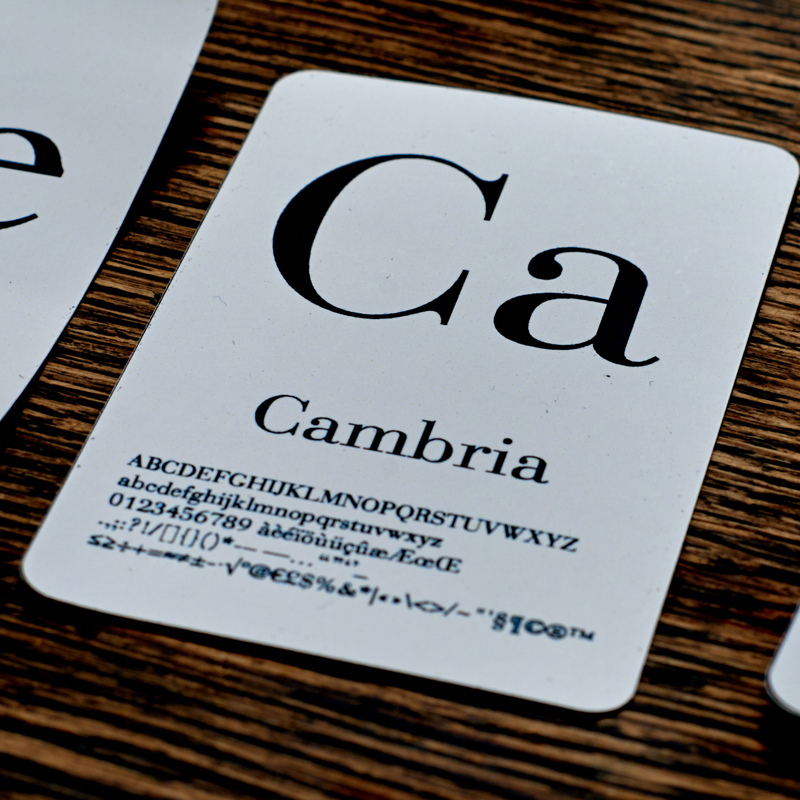 The more pronounced the serif, the stronger the association with stone carving, as in Cambria above. You can have fonts with heavy serifs like slabs, such as Rockwell, lighter serifs, such as Garamond, flares which imply serifs but aren’t, such as Optima, and no serif at all, such as Gill Sans. Fonts like Jenson, and Garamond give the strongest implication of stone carving, because they don’t have the strong pen-strokes of Cambria, and their serifs are true terminations. Glyphic fonts, such as Friz Quadrata, are designed to resemble stone-cut letters even more closely. The function of the terminations in stone carving was to stop the stone crumbling. 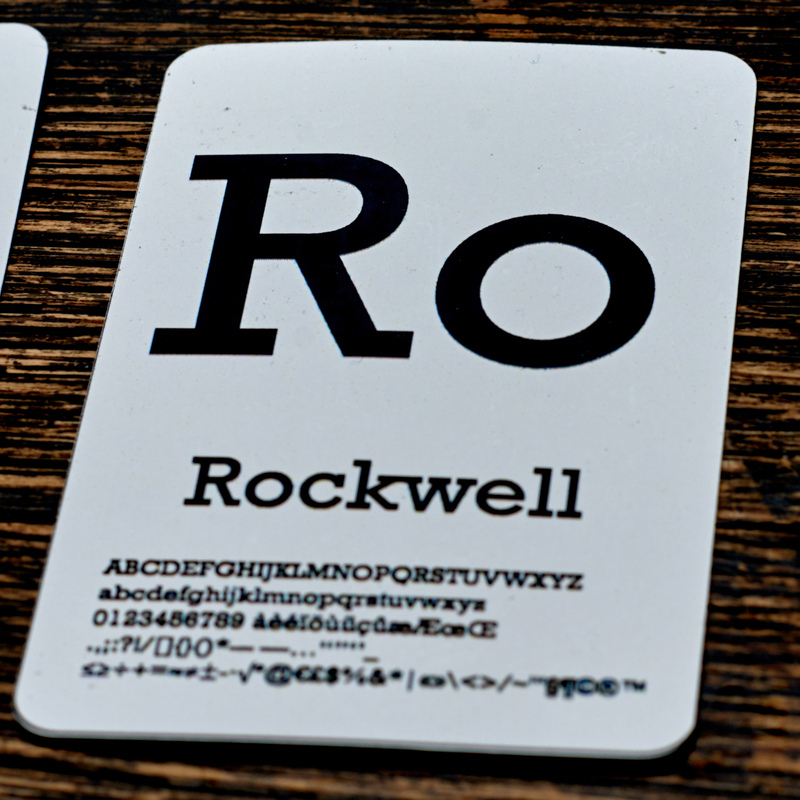 Slab-serifs like Rockwell are ‘more stone than stone’—they give an almost cast-in-concrete feel. At the other end of the spectrum, sans-serifs such as Gill Sans, Helvetica, Univers, Futura, Frutiger, Franklin Gothic and Avenir are implicitly more human, in the sense that they reflect handwriting by not having any serifs at all. Put the two together, and Optima is implicitly personal, because it has some variation in weight—like a pen—and no serifs. Univers is more personal than Helvetica, because, if you compare carefully, you will see slight changes of weight. Slight changes in the letter forms make for huge changes in the personality of the font when placed in body text on a page. 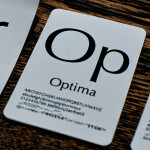 Association is about what products, services, organisations, publications and contexts we associate with a font. If you want to impress English-speaking committed Christians aged between 40 and 60, you could do a lot worse than set your text in Linotype Palatino. Why? Because the New International Version of the Bible, the most widely sold version (except among atheists, who prefer the King James Version) was originally set in Linotype Palatino. Under 30s will most likely have encountered one of the more recent reprints, but if 40s-60s is your target, and you want a Biblical level of authority, Palatino it is. Want to achieve the same thing, but for educated English speakers in the UK? 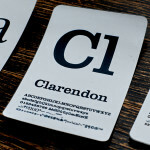 Clarendon is your friend. Clarendon is the font in which the Oxford dictionaries have traditionally been set. It has a strong educational feel about it, which may come across as a little stuffy, but noone in the UK could doubt its authority. Go to the USA, where Webster’s dictionary was set in a ‘Scotch’ modern roman, not unlike Times New Roman, and Clarendon does not have this impact. What do you think the ultimate heavy-metal font is, for loud music played by guitar bands? You might be thinking of something spiky, but the most photographed font in loud rock music, and the one you will see at most gigs, is the script letters used on the front of Marshall amplifiers. You can’t actually buy this font, and there appear to be no imitations available—perhaps there’s a reason for that. There are—broadly speaking—two kinds of visual association which we make. We could call these ‘above the level of awareness‘ and ‘below the level of awareness‘. Above the level awareness tells us that Art Deco style fonts are reminiscent of the 1920s, brush style fonts are reminiscent of signwriting, stencil type fonts are reminiscent of the army. These types of fonts, which generally have poor legibility for the same reasons that make them distinctive, can be very useful for posters, as headers in ad hoc publications, and to instantly call up a particular sense. However, because they are above the level of awareness (we know we’re looking at an unusual font) they also lead us to question their credibility. An invitation to a 20’s style dance in Braggadocio might lead us to check just how 1920’s it really is: we would look for clues in other illustrations, perhaps cue words like ‘Charleston’, ‘Swing’, ‘Jazz’. The reason is that we’ve all seen that particular kind of font ‘misused’ by someone who just wanted to create a 20’s feeling to get your attention, before selling you tickets to the Freshers’ disco. Below-the-level-of-awareness associations are much more powerful, especially when they are combined with colours, shapes and photography which all softly imply the same message. The most important soft implication is x-height, which is the proportionate height of the letter ‘x’ compared to the ascenders (‘h’,’l’,’f’,’t’,’b’,’d’,’k’) and the descenders (‘g’, ‘j’, ‘p’, ‘q’). High x-height gives greater readability within the same point size, but this has only been discovered during the past fifty years. What this means is that the greater the x-height, the more modern the font appears. 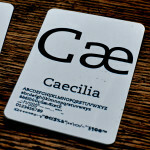 If you are looking for ‘modern’, look first for high x-heights, such as Cambria, Caecilia and Avenir. If you want to look more classic, consider a smaller x-height, such as Walbaum, Jenson or Bodoni, and most versions of Garamond. 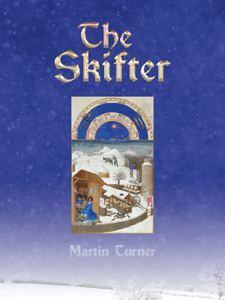 Most books are printed with serif fonts, often of the Baskerville kind, with the leading set to 130% of the font size (in most print it is 120%). 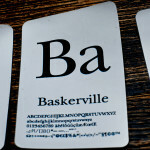 If you want people to settle down to read extended text, the associations of Baskerville and its ilk (especially with slightly more leading) are very helpful. 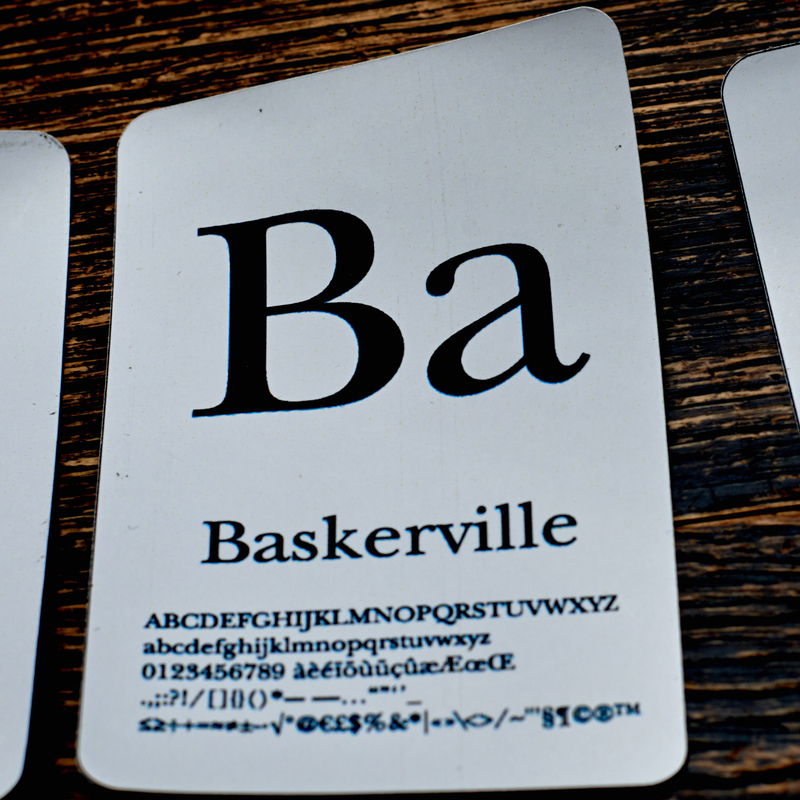 This is the underlying reason why the famous study found Baskerville to be ‘more credible’ than Georgia, Helvetica or Trebuchet: we’ve seen lots of books printed with it. Want to give people instructions? Especially short instructions? DIN Mittelschrift, a version of which is now available as FF DIN, was the font on all the German motorways for decades. 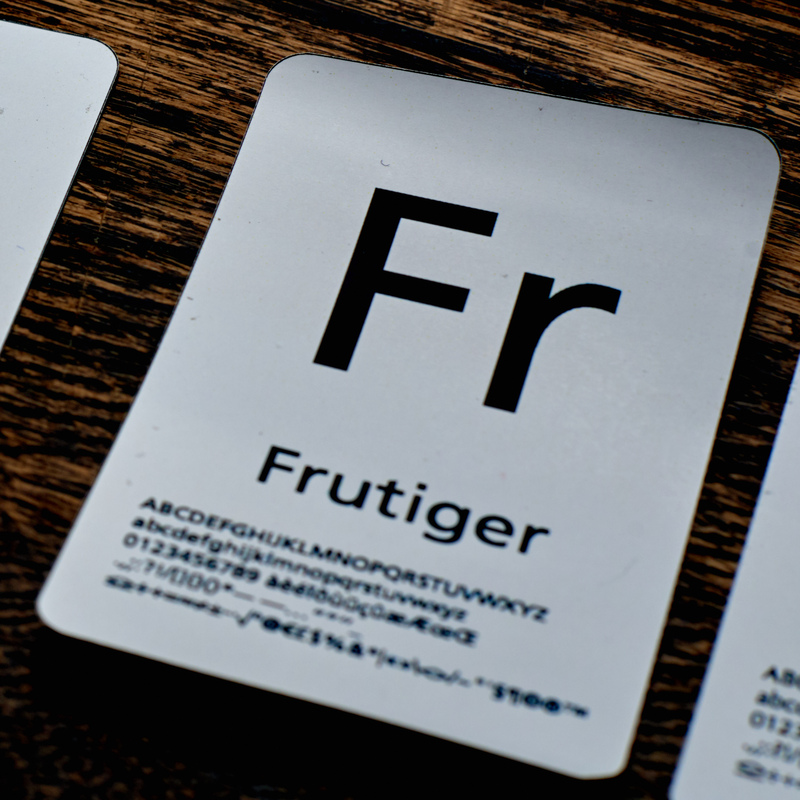 Frutiger was originally designed as the font for an airport. If you’re wondering where you saw it last, it is the official font of the NHS, used both in the NHS logo and also (supposedly) in all hospital and health centre signage. Railway stations in the UK are signed in Gill Sans, which was the official font of British Rail and remains the main font for Network Rail. 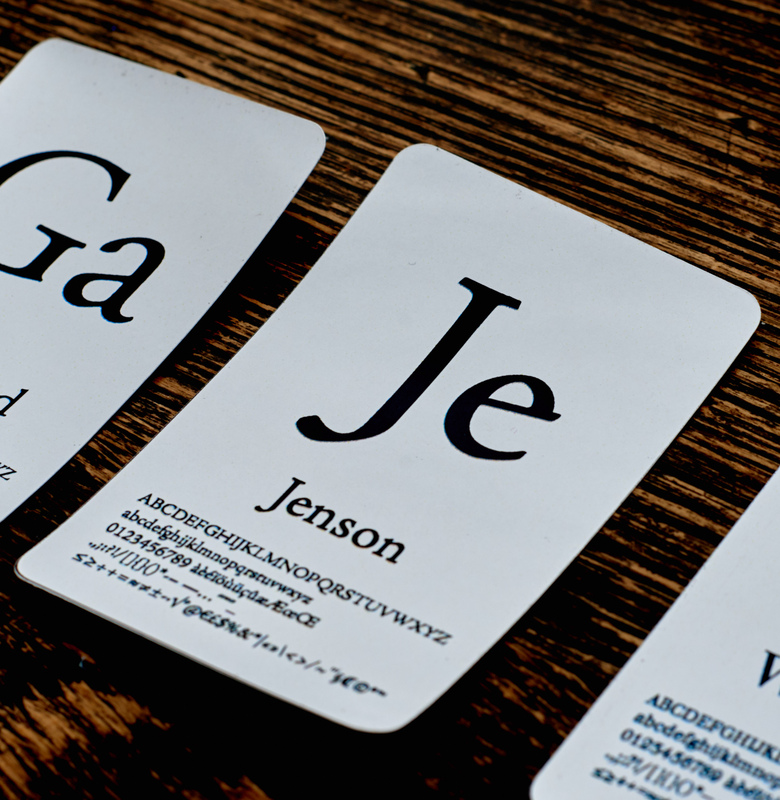 It was based on an earlier font designed for London’s underground. 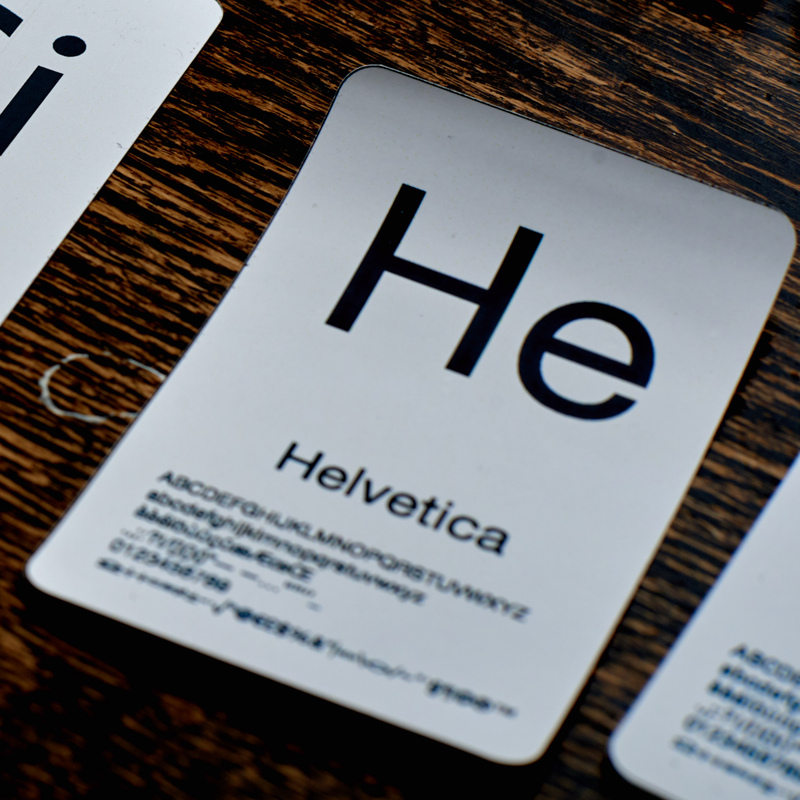 Helvetica is one of the most widely used fonts in the world, prized for its neutrality (after all, it is Swiss). It has perhaps thrived especially because it is subtly better drawn than Arial. While Arial was licensed on Windows computers, Helvetica came standard with design-focused Postscript printers, and with the Apple Macintosh, which, for years, was mainly used in creative industries. Result: you have seen a lot of good typography done in Helvetica, and a lot of very bad typography done in Arial. For something which isn’t Helvetica, but just very slightly more elegant and personal, you could look at Frutiger, but it would also be worth looking at Univers—it has slightly tapered strokes which imply a slightly more hand drawn, and therefore personal, origin. It’s not possible to give a complete list of even the most common associations, nor is it necessary. If you are typesetting for a particular audience, just go out and look at the kinds of things they buy, use and experience. Want to reach teenagers between 13 and 17? Absolutely do not look through your font collection for a ‘teenage’ font. Whatever you think is teenage is probably identified with a previous era—eras lasting only five years in teen world. Go and buy some teenage magazines, wander round teenage sections of toy shops, look at some teenage websites, and look at the fonts on hit album covers. There’s no point asking a teenager to tell you what a ‘teen’ font is. You are looking for things below awareness, which, by definition, they aren’t if someone can point them out. Things above the level—display fonts, usually—are ‘old’ before they are even issued. While you can search for a lot of this material on the internet, you can’t do a search for ‘what fonts are teenagers using’ (without getting a load of opinions from people fondly remembering their teenage years in the 80s and 90s), or ‘what font is good for selling pies at a football ground’. This is probably a good thing, because by it being a little more difficult, it slows the inevitable erosion of good typefaces used inappropriately by people trying to create a false impression. You need to go through at four steps—first, search for ‘top ten albums sold to teenagers in 2015’, then look up each album, and then use Fontedge (in TypeDNA) or ‘WhatTheFont’ (search for those exact words) to tell you what the font is. You can now do a search for ‘alternatives to…’. Negative space — counters, being the ‘eye’ in the ‘e’, the ‘a’, the ‘o’, the ‘d’, ‘b’, ‘p’, ‘g’, and the negative space outside the letters. Stroke weight — from light to heavy and from uniform to strongly differentiated, possibly with some tapering, and possibly heavy at the bottom of the ‘e’ and some other letters. If you know what is familiar for your target readers, you can analyse the letter-type you have found using these seven characteristics. What would happen if you changed one aspect? For example, you could be creating a magazine to rival one set in Avant-Garde Gothic. 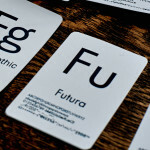 What would happen if you put a serif on that? The answer is you would get something like Lubalin Graph, similar to Rockwell (one of our archetypes). You would have an entirely distinctive look and feel, but it would also seem very familiar and appropriate. Equally, imagine that you are updating a publication which has relied for years on Garamond, and is now feeling a little tired. You have a couple of choices here. You could move from the Garamond you are using (there are many variants) to ITC Garamond, which has a higher x-height and feels more modern (though many designers would disdain you, as ITC Garamond is widely considered to be an inferior version), or you could retain the same overall look but move to Bembo, which has a greater x-height, bigger counters, but the same stroke weight, approach to letter shapes (but with a better ‘a’) and general feel. TypeDNA will help you to pair fonts, but, as a sanity check, it’s always worth looking through the set of characteristics. Two fonts which are more or less the same but one has a serif and the other doesn’t will probably work, if you set one of them in a heavy weight and the other in a book weight. Put them together in the same weight and it will look like a mistake: too similar, like putting 10 point text next to 11 point. Finally, don’t be afraid to delve into FontBook to find exactly the font you need, rather than relying on the fonts that came with your computer or software (almost certainly overused, except for Franklin Gothic which always looks good) or on the free fonts from the web. If you are going to spend £5,000 on print over the next three years, it’s worth spending £500 (no, I mean, really) on getting exactly the right font, as opposed to one that is sort of right. If you’re spending £500,000 on print, you would be daft not to get exactly the right font. Even if your investment is your time, it’s still worth working out: what is that my readers are most familiar with in this context? Change one thing on that.